Why not celebrate with us! The perfect venue for a fantastic day out, the whole family can enjoy. Here at the farm we have a magnificent variety of animals and birds. You will have the opportunity to feed, touch and interact with the animals or just relax on the decking overlooking the duck pool with its tranquil waterfall. The Hayrack Cafe is a welcoming place, open daily serving a delicious range of freshly prepared 'home-style' snacks and cooked meals. The childrens menu is always popular. We also serve an impressive selection of tempting home bakes, cakes and biscuits plus a large selection of the famous 'Kellys Ice Cream'. Our outdoor decking area is the perfect place to relax and watch your little ones amuse themselves on our fun filled adventure playground which will keep them occupied for hours! Relax in our spacious cafe and choose from a variety of home cooked meals and snacks made on the premises from locally sourced produce. Weather permitting, enjoy your food outside on our decking by the tranquil waterfall. During your visit, you can feed, touch, interact and learn about our many breeds of farm animals and birds. Some of our animals are free to roam around our walkways. Just £3 Entry, FREE for under 2 years. 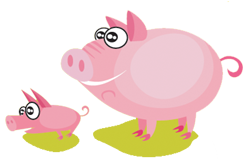 Hayrack Church Farm is the perfect venue for parties, whether you're 6 or 60 we can tailor the perfect package. 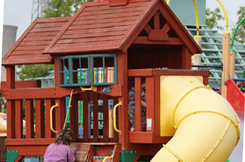 There's a choice of lots to do including visiting the animals, painting pottery and playing on our outdoor play equipment. 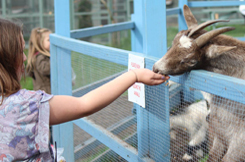 Hayrack Church Farm offers fantastic educational visits for pre-school, schools and groups.